Our TY Series Turbine Oil Purification Systems are being successfully used by hundreds of industrial companies which involved in hydropower project, Gulf Fertilizers, Mills and many more turbine users. This Turbine Oil Purification Systems are being helped to increase turbine filter life by removing varnish, particles, sludge formed in the oil and stopping its further formation by removing emulsified water and releasing the gas from the oil. This type Purification System could clean the oil down to NAS 5, removing contamination & particles down to 5 microns, and emulsified water down to less than 60 ppm, ensuring that there was no valve sticking problem in the governing system. Customers are unable to achieve these results with the use of a centrifuge. 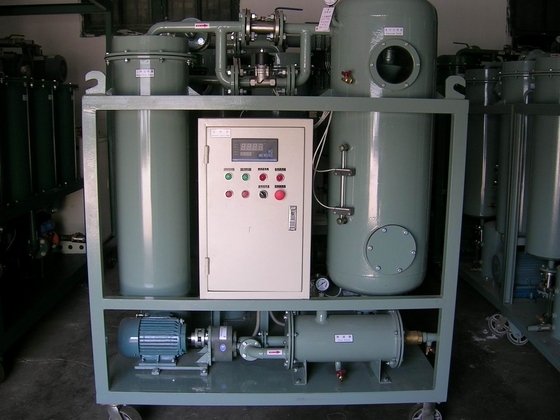 This Oil Purifier can remove contamination down to less than 5 micron, water content down to 60 PPM, air & gases down to 0.1% and lower oxidised molecules of oil from turbine oils. Removal of free and emulsified water prevents formation of varnish and bacteria. Turbine oil is 98% base oil and it has approximately 2% additives. By keeping the oil free from water and contamination down to less than a micron, TY Series Oil Purification Systems protects the turbine oil additives, which can then continue to perform their essential functions for a very long time thereby increasing oil life tremendously. 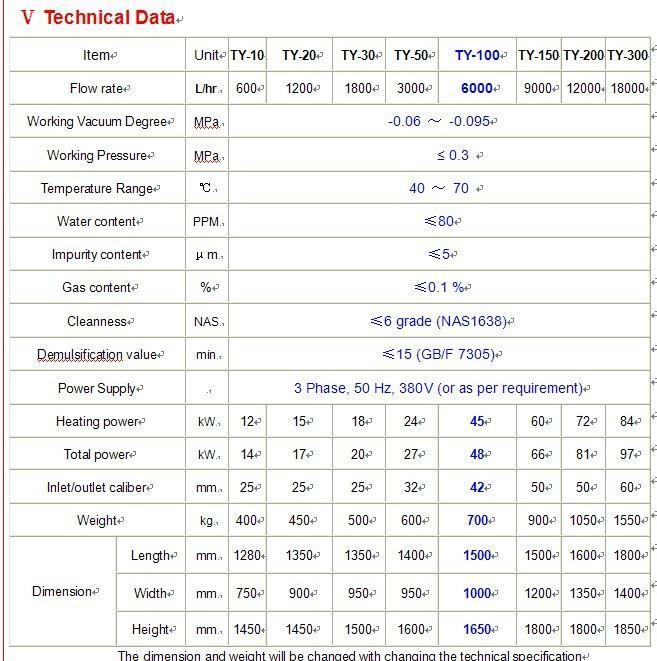 TY Series replaceable filter element uses special filter media which not only removes particles by depth filtration but it also has an affinity to remove varnish, sludge and lacquer from oil by adsorbtion. TY Series filter is unaffected by water and can remove large quantities of contamination which makes it a very cost effective tool for removing contamination from turbine oils. TY Series can be installed directly on any turbine oil reservoir as a by-pass oil cleaning unit or it can be used as a mobile machine. TY Series mobile machines are fitted with pump / motor, pre-heater, vacuum pump etc to clean oil in the parent machine oil tank or outside it in drums or other reservoirs. When the machine start, oil is flowed into primary filter under the difference pressure between inside and outside and big impurities are removed. After heating, oil flow into secondary filter. Then oil flow into water separator after small impurities are removed. The water separator adopts a special skill which changes the impaction of oil and water to speed up trace water and coagulate big water which is separated from oil and stored in water content. Oil is purified again by fine filter, the flows into vacuum pump which use stereo-evaporation removing left trace water. Vaporized water was drained away by cooler or vacuum system. When the oil was transported out by oil pump, the purification process has finished.